A dear friend of mine, who grew up surrounded by artists, fell in love with gems in one of the most rarefied ways I have ever heard. The American mid-century master Robert Rauschenberg showed her his collection of precious stones when she was a pre-teen. His interest in rocks and their discussions about them inspired her to become a jewelry designer. When she first told me this story, I was surprised to hear about Rauschenberg’s fascination with gemology, because his amazing creations are all collage and Combines with found objects, but then I realized it made perfect sense. Artists have a passion for beautiful materials. He appreciated the aesthetics of the natural wonders. 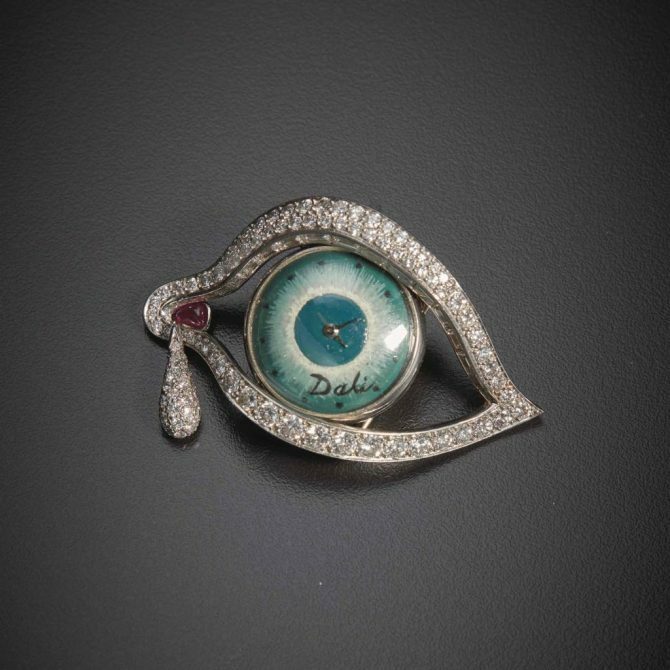 While Rauschenberg’s only foray into jewelry was mini Combine brooches executed by one of his assistants, gems were just a hobby, many other artists have made jewels. The little-known necklaces, bracelets, earrings and rings created by famous painters and sculptors are experiencing a revival right now. Louisa Guinness who not only collects, but also has a gallery in London devoted to art jewelry, published a book on the subject, Art as Jewellery: From Calder to Kapoor that was released last month. On March 7, 2018 the exhibit From Calder to Koons, Jewelry of Artists. 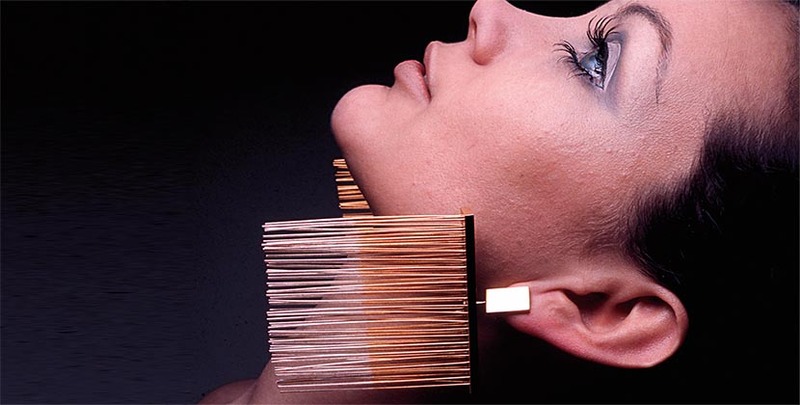 The Ideal Collection of Diane Venet, will open at the Musée des Arts Décoratifs in Paris. In the history of the genre, there are two artists who rank supreme: Alexander Calder and Salvador Dalí. Calder’s lyrical hammered brass, silver and gold creations that were in a spectacular 2016 show at Louisa Guinness, have been more influential than any other artist’s jewels. 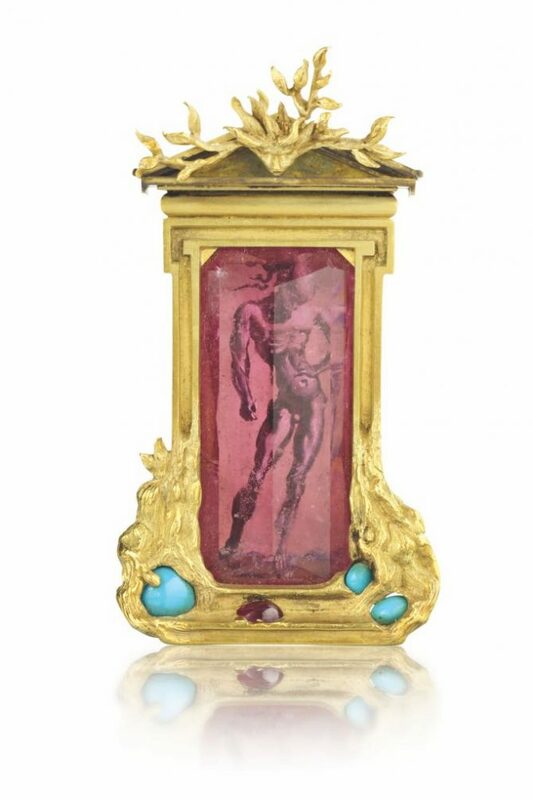 Dalí’s first foray into jewelry was a collaboration with the great Fulco di Verdura in 1941. Several years later he entered into a long relationship with the Argentinian jewelry manufacturer Carlos Alemany who transformed his imaginative designs into magical creations. While Dali and Calder worked at the opposite ends of the spectrum in terms of the value of their materials, what they shared was a sense of the medium. Their work wasn’t shrunken down renditions of their art. It was fully realized as jewelry. Beyond these two masters, there are a handful of artists who made interesting forays into the field. 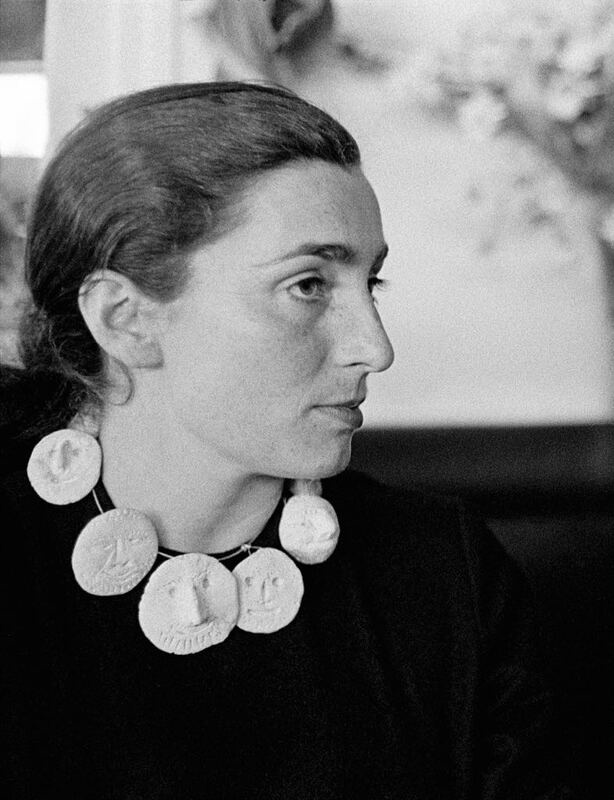 The best of Picasso’s jewels are fascinating largely because they link to his love life. 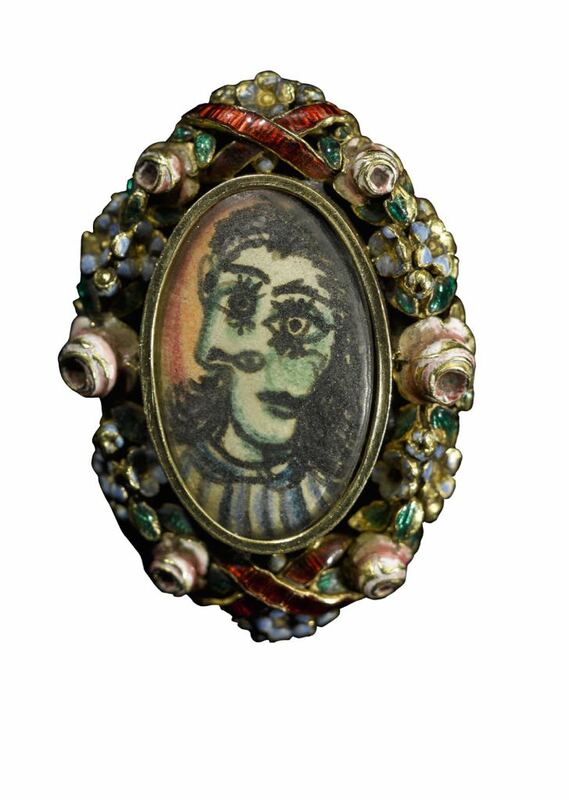 One of the most endearing pieces Picasso gave Dora Maar was a vintage costume ring he set with a miniature portrait he painted of her. He made a beautiful ceramic necklace of faces for his wife Jacqueline Roque. You can feel the passion Picasso put into creation of the jewels. 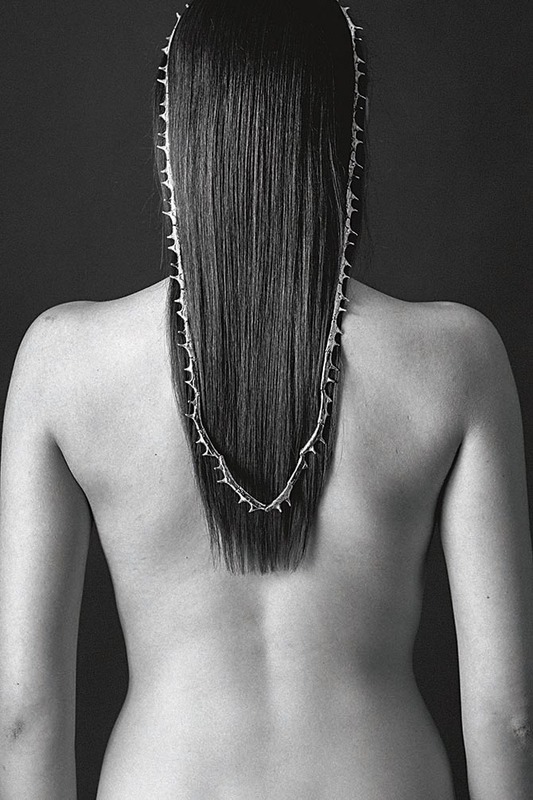 Man Ray made some interesting jewels. The contemporary artist Claude Lalanne has done some nice florals. Jesús Rafael Soto’s kinetic art translates into cool earrings and rings. There are others I could name who have done good work. There are also a lot of artists’ jewels that, while they may be fun, they do feel somewhat commercial. 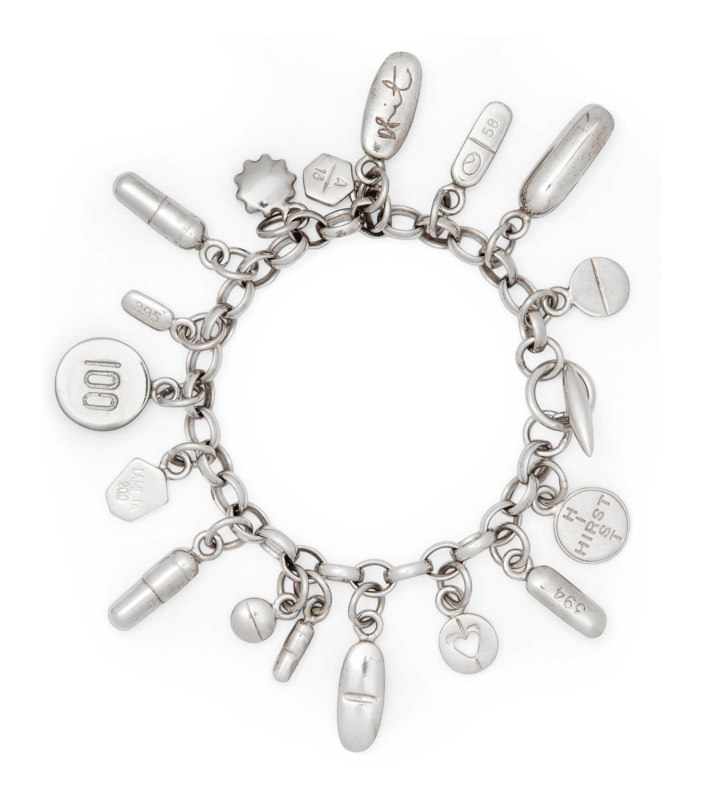 Damien Hirst’s pharmaceutical pill charm bracelet is one example. While Kenny Sharf’s heart lockets and Keith Haring’s golden baby brooches are both darling, they are far from art with a capital A. There is so much that is enjoyable in jewelry by artists, I would not normally be compelled to point out the lesser examples. Excluding Calder and Dali, I have always thought of jewelry by artists as intriguing novelty items. When the jewels are not personal, they generally feel like something made for super fans. In the coverage I am reading, however, it seems like advocates of the genre have a notion that it is better, specifically more creative, than jewelry made by jewelry designers. I am not totally clear why these experts are bringing up the concept of traditional jewelry compared to the genre they enjoy. It’s the proverbial apples and oranges on so many levels. If the desire is to be competitive about creativity, why not compare the styles to innovative costume jewelry or the mid-century modernist work by masters like Art Smith as well as fine jewelry? It just seems odd they are trying to take down fine jewelry as a way of illustrating jewelry by artists as a higher form. Simply put, it’s not. It’s a different area of jewelry that shouldn’t be looked at in the same way. What’s worse about these statements is that they are archaic generalization. It feels like a mid-century mindset when, perhaps, there were more rules in fine jewelry. Of course today, you can find commercial fine jewelry, but there is also lots of imaginative work being made at every level, from High Jewelry to emerging design talent. 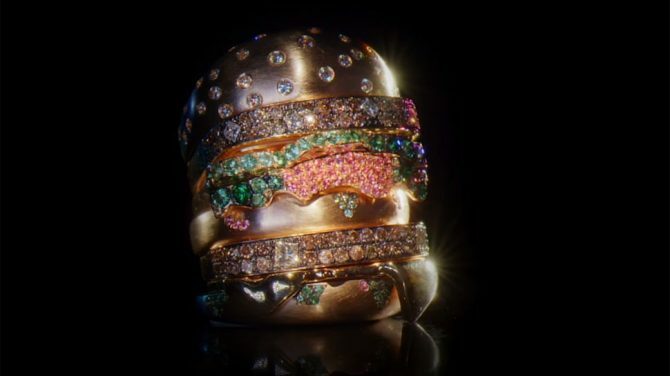 In the context of art, one piece released just weeks ago leaps to mind: Nadine Ghosn’s Bling Mac, a stack of gold and gem-set rings that form the two all beef patties, Special Sauce, lettuce, cheese and pickle on a sesame seed bun. It is a precious piece of Pop Art, a design jewelry collector Andy Warhol would have loved. No question, Robert Rauschenberg would have appreciated the gemstones.